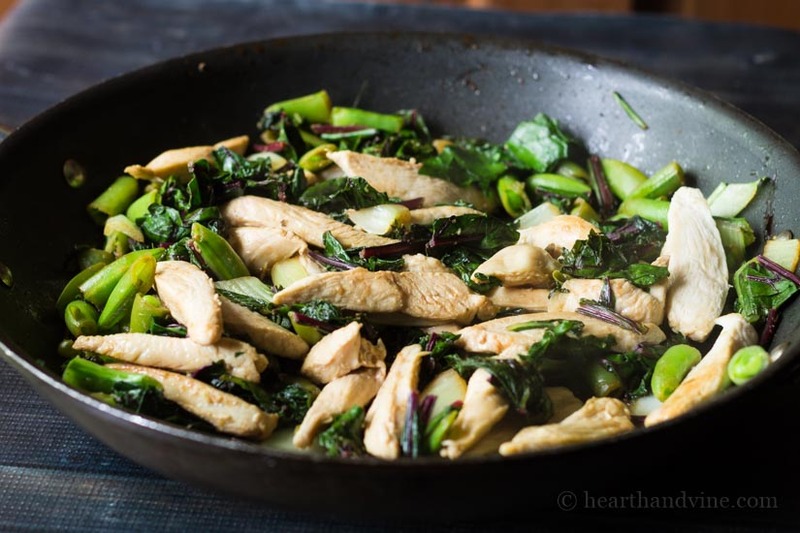 This recipe for summer greens stir fry, is a great way to use all your fresh greens from the garden, for a quick and healthy meal. The CSA program at Stone Church Acres Farm is well underway. This week our basket was full of delicious greens and other goodies, so I decided to make a simple summer greens stir fry for dinner. Summer is the perfect time for a stir fry meal. There are so many tasty fresh veggies available, and nothing tastes better than homegrown or straight from the farm. This week we received, beets, arugula, bok choy, and sugar snap peas. There was also a nice head of lettuce, Italian zucchini, a pint of black raspberries, and a quart of cider that they made in the fall and kept frozen over the winter. My husband quickly grabbed the beets to make his pickled beets and eggs. I asked him to keep the tops from the beets to use in this dish. I cleaned and chopped up the beet greens, arugula, bok choy and sugar snap peas. They quickly filled this large saute pan. It’s really amazing how quickly they cook down after only a couple of minutes. Thinly sliced cooked chicken is tossed back in at the end for added protein, but you could leave it out. Adding fresh and aromatic ingredients such as fresh garlic, ginger and lemon, add the perfect flavor with this group of greens, which can sometimes be a little bitter. Served it with brown rice on the side for a delicious hearty and healthy meal. Add the rest of the oils, the greens and peas to the pan. Saute for about a minute. As the greens begin to wilt add in the garlic, ginger, soy, and vinegar. Continue cooking for another minute or two until the greens are wilted down. Add the chicken back to the pan and stir. Add the lemon juice and cook for another few minutes until the chicken is cooked through. Looks amazing and delicious and quick to make…heating up the kitchen is so not happening around here….thanks for a fun recipe. I’m so glad you like. You can use the recipe as a base and create you own favorite combination. Haven’t made stir fry in awhile, this looks simple and amazing. Fresh veggies are the best and what a treat to have a nearby CSA program, I’ve been enjoying cucumbers from the garden and I’m amazed at the quantity coming from one plant. Enjoy a great weekend.. I have been loving the CSA. I only go every other week, and I get half of what a regular basket receives, but it’s the perfect amount for Phil and I. Next year I hope to grow a few things myself but I may continue with the CSA. It’s a little like Christmas morning seeing what goodies are in the basket. Enjoy those cucumbers. I bet they make a great snack!